My favorite thing about cooking is experimenting with new combinations of ingredients. When I saw this recipe, I was so intrigued by using unsoaked almonds and sun-dried tomatoes together, let alone in a veggie burger recipe. To date, these are some of my favorite veggie burgers. I’ve tried plenty of recipes that end up tasting OK, but these are so different. The sun-dried tomatoes totally make these and the almonds give it a great texture. The other thing that surprised me was how versatile they are – they tasted great with hummus in a wrap, and great with our favorite Hampton Creek Truffle Mayo. They’d probably also be great with caramelized onions. Let me know if you find another topping for them! In a food processor, add the almonds, tomato paste, dried oregano, dried basil, salt, garlic, balsamic vinegar and coconut aminos. Purée until nuts are very fine ground. Do so enough so that the almonds release some oils so patty mixture can be somewhat sticky. Add the green onions and sundried tomatoes and pulse until mixture becomes dense and starts to hold together. Add the quinoa (or brown rice) and pulse until well incorporated. Refrigerate for at least 30 minutes. (We made burgers as we needed them, over the course of 3 days, refrigerating the mixture we didn’t need). Heat a large nonstick pan over medium-high heat. Using an ice cream scooper, make slider size patties and carefully place in pan. Cook for a few minutes in each side. (NOTE- These have great texture but can become dry and crumbly is overcooked). 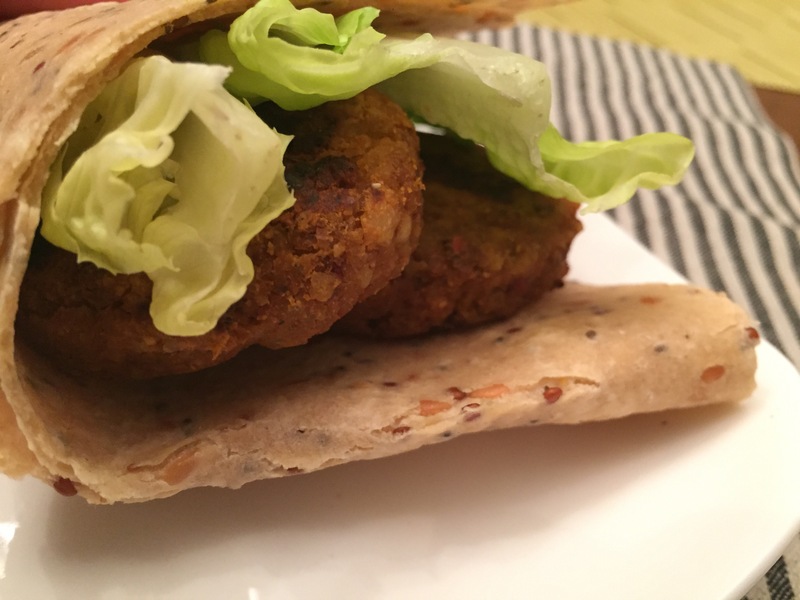 Enjoy in a wrap, with a burger bun, or plain.